This pupose of this site is to document and share my experiences whilst volunteering in South Africa. However in addition to this, from time to time i will include blogs on a variety of other topics that interst me such as football and everyday news. Enjoy and feel free to comment! So it’s the 1st September 2008, and yet again rumours circulate that Man City are subject to a takeover forged by another Multi-Billionaire. My initial thoughts were ‘oh here we go again’, another financial muscle head attempting to buy success. However with myself being a Chelsea fan and pleased with our success over recent years there’s only so much criticism i could give, as for many that would be hypocritical. Although my pessimism on City’s takeover was ever present, my fears over the prospect of another Premier league challenger were soothed when i put a realistic perspective on things. Well, we all know you need more than money to build a successful football team…don’t we? We all know that to create a success football team, you need more than just world class players, Real Madrid have proved that after all during the past couple of seasons. A successful football team needs to contain certain things that money cannot buy. A team needs to play with passion, determination and the right ethos. Basically the team needs to be a team, not a collective horde of individuals. Here is where my scepticism on Manchester City’s attempts centralises around. Of course i am slightly bias, but when Roman Abramovich took over Chelsea despite paying extravagant sums of money for certain plays such a Damien Duff, Claude Makelele and Hernan Crespo, i do believe that there was an element of elegance and integrity in the way they perused such talent. It seemed that a great amount of consultation and care was given when drawing up transfer targets. On the contrary, it seems to me that City are rather acting like poachers. I often joke that Roberto Mancini has spent his pre-season stuck at home watching Sky Sports News, eagerly awaiting for any breaking news surrounding potential targets for other Premier League clubs. Only upon hearing of Chelsea or Manchester United’s newest transfer target, to hastily ring up Garry Cook (of whom is on speed dial) and frantically shout down the phone instructing him to do whatever he can to hijack the player. And of course, who could forget Manchester City’s attempt to lure John Terry last season, i mean the cheek! To this day it seems like Manchester City are just trying to buy the world’s best footballers, with no consideration of their suitability to the club itself of the English Premier League. I mean, i am of course in favour of buying proven talent, but surely the true recipe of success is to build not buy a team. I feel this is a recipe Chelsea following perfectly, building a team around ‘blue-blooded’ players such as John Terry and Frank Lampard at least puts some credibility towards their recent success. In contrast Manchester City didn’t show any signs of hesitation when shipping their long-term captain, a certain instrumental Richard Dunne. Another amusing scenerio was the touchline spat between Mancini himself at the fiery scotsman David Moyes. Now many may say look at Mourinhos many controversial acts during his reign at Chelsea, but at leasts he’s as charecter who you love to hate. 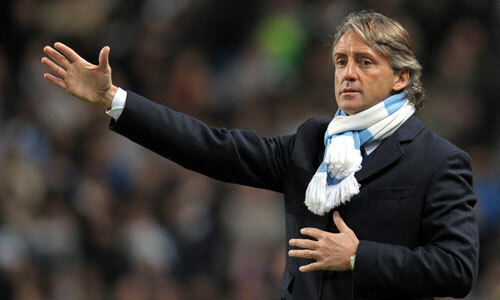 With Roberto Mancini you constantly wish to tighten that stupid scarf he was sporting throughout the close season. It is the way Manchester City went about their business which soothed my fears of another honours challenging team in English football. After all i am not a neutral, i am a Chelsea Supporter. However now my initial worry, has become a worry for football itself. Manchester City i feel are putting football to shame. Ok, they might buy short term success, but they are doing so with the ugliest face. In truth, long term success needs to based on solid foundations and i see a lack of these within the City of Manchester Stadium. I hope football teams learn from Man City’s guide ‘How not to buy success’, and for the sport any team with similar financial backing in the future to peruse things differently. Despite my scathing attack on Manchester City’s transfer policy i no not think Chelsea got it perfect. I may be a tad bias, but i am defiantly not blind. However i do think they got the fundamentals right when targeting success. Don’t get me wrong they had their failures, but at least there was an element of class about the way they did it….or maybe this is simply due to the stereotypical tags associated with the Kings Road and the location of Stamford Bridge rather than for footballing reasons. Categories It's Football... not Soccer!